Every summer the nautical theme finds its way back into stores and with it comes an array of nautical creatures from the sea. Well, move over seahorses and lobsters, here comes the octopus, tentacles and all! This particular octopus tee shirt is from the J. Crew Factory. It's one of their "collector" tees and I was instantly drawn to its quirky, yet still nautical subject matter. I gave this inky eight-legged creature a bit of an 80s feel with the addition of a graphic midi skirt from ASOS and a few pops of neon. I would certainly rather look at an octopus on a shirt, see one in an aquarium or hear a song about one in its garden (what is that song about anyway?) as opposed to eat one. At our favorite Japanese restaurant, my husband often orders a sushi combination plate that includes one pieces of octopus sushi. He's never thrilled about eating it, as it is pretty rubbery, but the last time he ordered it, it was simply inedible. The good news is that our dog, William, loved it. I guess he's a big fan of octopus! 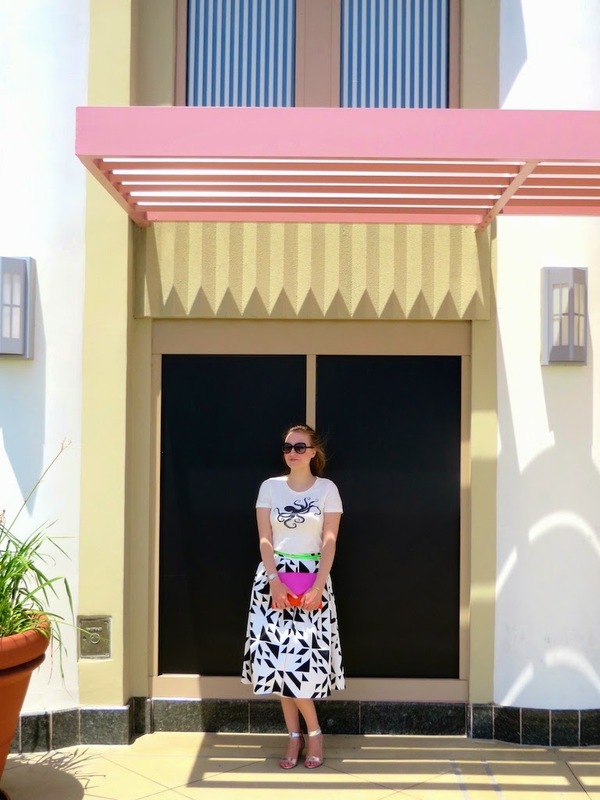 It was only after putting this post together that I realized that I actually have another piece of octopus related garb, which is my Marine Mural dress dress from Anthropologie. I realized that I also called that post "Octopus Garden". Oops! If you are so enamored with Octopi and just can't get enough of them here you can check out that post here. And now that Beatles song is stuck in my head. :P And I'd much rather have calamari! What a beautiful outfit. You look like a piece of art!